Kellogg Community College will be holding auditions for roles in Agatha Christie’s world-famous murder mystery “The Mousetrap” from 7 to 9:30 p.m. on Thursday, Sept. 13, and Friday, Sept. 14, in the Binda Theatre on the college’s Battle Creek campus, 450 North Ave. 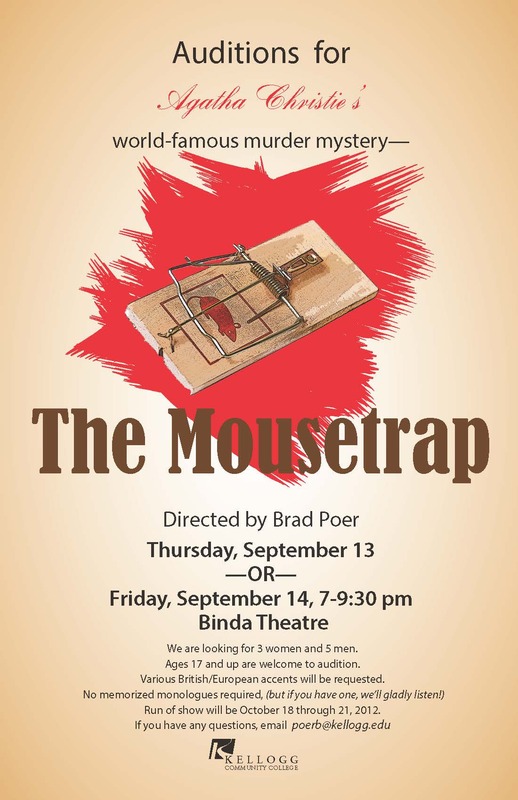 The production of “The Mousetrap” will be directed by instructor Brad Poer and is scheduled to run Oct. 18 through 21. For the auditions, the college is looking for three women and five men. Persons auditioning for roles in the play must be 17 or older. While various British/European accents will be requested, no memorized monologues are required to audition. For more information, email director Brad Poer at poerb@kellogg.edu.